Malcolm Lowry’s books are all about depression and alcoholism. And most of them he was too drunk and sad to finish before he drank and pill-popped himself to death in 1957. Lunar Caustic is a novella that was published in the Paris Review in 1963 and then as a book in 1968. During his lifetime, Malcolm Lowry only published the INCREDIBLE Under The Volcano (which if you haven’t read I cannot recommend enough) and the excellent young-man-on-a-boat-book Ultramarine. However, he left stacks of other stories and poems and letters and novels when he died, pretty much all of which has been published in some form at some point in the last half century. Lunar Caustic is broadly considered top-quality stuff. Other than Under The Volcano, I believe it’s the only book of his still in print in the UK*. It is about an alcoholic, Bill Plantagenet, one of the many Lowry-ciphers that exist throughout his works. Plantagenet, an Englishman, has been picked up by a New York policeman in the depths of delirium tremens and escorted to a psychiatric hospital for treatment. Whilst there, reeling from hallucinations and paranoia and terrible shakes from the lack of liquor, he befriends an old man and a young boy, both of whom seem to be the sanest people there. Plantagenet, with his education and his accent, charms and chats with the doctors, stares out of the high windows at the East River, occasionally thinking on the life he has lived, but mostly enjoying the moment and growing to feel affection for the people around him. It is a beautifully poetic work, full of striking imagery and elegant prose; it is tragic, too, as all of Lowry’s work was. To match his life, I suppose. He wrote, he claimed, about himself; thinly veiled, slightly changed. He wrote harrowingly stark accounts of the terrible and terrifying effects of alcoholism on the body and the mind, yet despite his clear conscious awareness of the problem that he had, he was never able to escape it. 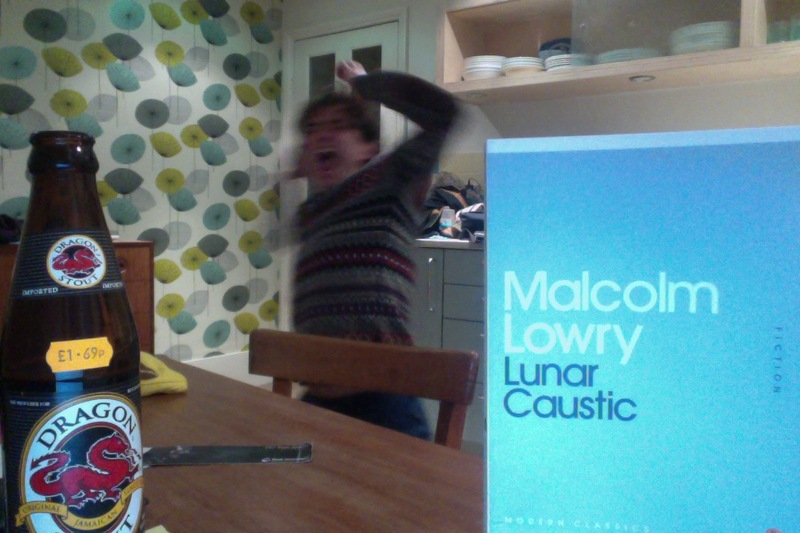 And here, in Lunar Caustic, the protagonist, the Lowry-veil, does OK, he does well… He begins to feel affection and empathy and compassion again, he begins to care, he starts to try to help others, begins to want to help himself… Yet by the end… It’s a tragedy, one can tell that from the start. It’s obvious where he’ll be again at the end, but that doesn’t mean that the loss of hope isn’t an unpleasant experience for a reader. Malcolm Lowry’s Under The Volcano was the best book I read last year. I cannot recommend it highly enough. This was good, for it captured its writer’s style and his bleak hopelessness. But it was a novella, 88 pages in a tiny Penguin Mini Modern Classic, so there was only so moving it could be. If you want a taster of Lowry, go for it, it’s £3 brand new. But Lowry deserves more than a taste. Lowry deserves you reading Under The Volcano. Whoever you are. READ IT!!! EDIT: For more information on Lunar Caustic, please read this later post on an academic edition published in 2015. * This could be wrong.